eBay Powered by Frooition About us Shipping Returns Contact us Our Reviews Promotions Game Party 3 Shop Categories Helpful Links Add to Favorite Sellers Sign up to Newsletter View Feedback Contact Seller Visit seller's eBay Shop About Seller Page Game Party 3 Item Description Ultimate Game Party expands on the highly successful Game Party franchise, offering new games and re-imagined favorites. Perfect for a play session with the family or an evening with friends, this diverse game collection is sure to provide hours of enjoyment at an affordable price. With easy controls, customizable characters and diverse game play, this is a must-have title for every family!Features:Four-Player-Party - and More! 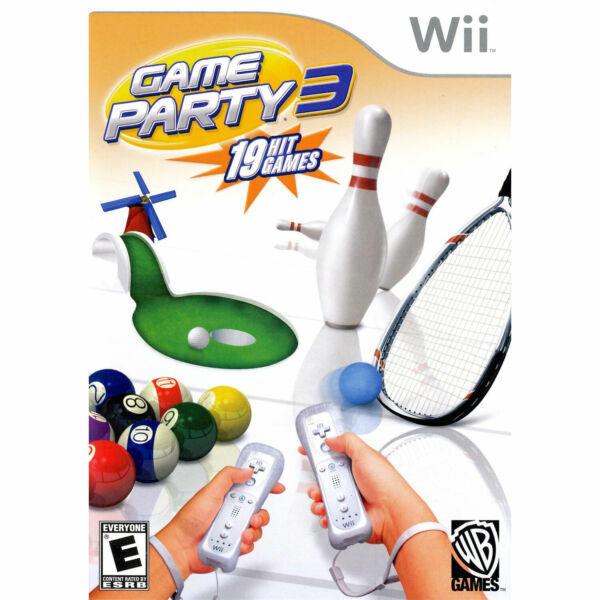 : Challenge up to three of your friends to battle for the top spot in each game, or liven up any party by setting up a competitive tournament of up to 16 players to determine an ultimate champion!Get the Party Moving: Shake, wiggle and slide with your Wii remote.Customize Your Party: Succeed on challenges and unlock extras to update customized players, all the while earning tickets to trade in at the store for cool prizes.Game Variation:Actual product received could be slightly different than what picture shows. To clarify the main photo may show the standard edition but you could actually receive the Greatest Hits, Platinum or a store specific version e.g. Walmart exclusive or Best Buy exclusive. Game Manuals Certain publishers have opted not to include physical manuals. If you do not find a manual please visit the publishers website for a digital version. You May Also Like More Items!View more great items Video Games Game Consoles Accessories Toys 2 Life Last Chance About us Shipping Returns Contact us Our Reviews Powered by Frooition Frooition | No-js Template | eBay design, eBay store design, eBay shop design, eBay template design, eBay listing design (ver:froo_no_js) This listing is currently undergoing maintenance, we apologise for any inconvenience caused.